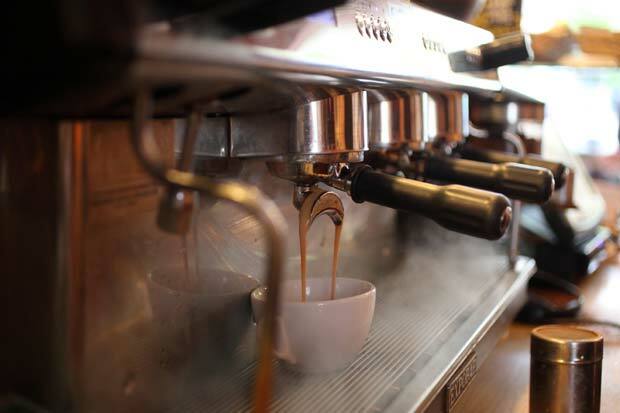 Whether you need a quick caffeine ‘fix’, a taste of home-made goodness, somewhere to chat, meet friends or while away a bit of time – you’re always welcome at Expresso, one of Norwich’s favourite independent city centre cafés. Our passion for good food means that our menu is a bit of a moveable feast – alongside firm favourites you can expect to find tempting daily specials and tasty new combinations – incorporating the very best of locally sourced, seasonal ingredients. All available to eat in or takeaway. With seating both outside and in – and parking nearby – Expresso is the perfect place to take a break. From home-made superfood smoothies to freshly baked croissants & pastries, filled breakfast muffins, bacon rolls, bagels, porridge, toast – and of course plenty of coffee and tea! Filled baguettes, flatbreads – and our trademark man-sized grilled ciabattas. Current top five favourite sandwich fillings are: 1. Sweet chilli chicken with mixed pickles 2. Mozzarella, oven-baked tomatoes & pesto 3. Roast Norfolk ham, emmental and tomato 4. Hummous, Mediterranean roasted vegetables & feta cheese 5. Salt beef with gherkin, sauerkraut, mustard & emmental. And that’s not all! We’ve added chilli & rice to our ready-to-go range. Look out for our grab ‘n go boxed salads too! Something different every day – including classic comfort food favourites, ‘super’ salads and inspired pasta dishes. Baked in-house by our talented team, Expresso cakes are simply scrumptious – Great British baking at its best! Whole cakes are available to order (to pass off as your own!) as well as boxes of mixed cakes – ideal for workplace birthdays, or simply because it’s Friday! No two days are the same, but particular favourites to look out for include: • Sticky Toffee Pudding • White Chocolate, Pear & Raspberry Sponge • Rocky Road Slice • Coffee & Walnut ..not forgetting our home-made choc-chip cookies, flapjack, tiffin and gluten-free chocolate brownies! Vegan options too! Authentic, top quality Italian Segafredo coffee, ground to order at Expresso. A great flavour however you like your coffee. If you fancy something different why not try an iced coffee, a frappe or a flump! And that’s not all – we also serve an ever-increasing range of teas, herbal infusions, hot chocolate, soft drinks and shakes – along with a range of bottled beer, cider and wine. Or why not try a home-made smoothie, packed with natural goodness!